The UK Uncut planned events will take place on the weekend before the Queen’s Jubilee. 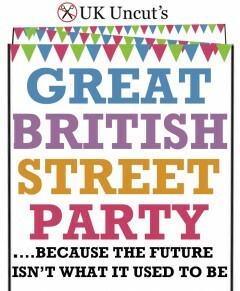 UK Uncut has dubbed these events as street parties with a ‘twist’. They plan to block major roads and high streets up and down the country to call for a ‘future uncut’ and protest the government’s cuts, austerity agenda and the closure of local public services. In a statement on their website, UK Uncut drew heavily on parallels with British society in 1948, the year when the Olympics were last held in London. They stated that although Britain’s post-war national debt was much higher than it is today, there was a future for people to look forward to. This included free universal health care, a new welfare state- that would protect and support the most marginalised in society- and human rights. They argue that these are being axed by the present government and that people can choose to fight for a future which they decide. Posted in: Activism, Outside Left, Politics, Public Spending.